Ciao! 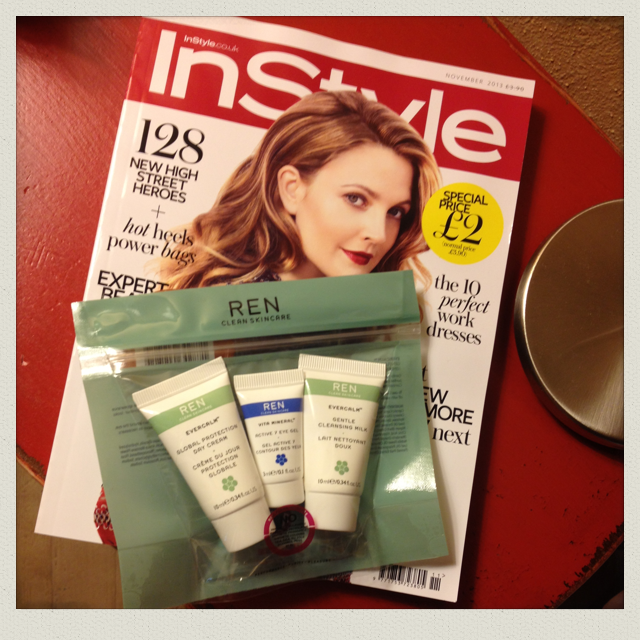 At the airport on my way to Italy I spotted November’s issue of InStyle which comes with three mini Ren treats: Gentle Cleansing Milk, Active 7 Eye Gel and Global Protection Day Cream. The cleanser felt calming but, if I’m honest, I’m not sure it would stand up to removing heavy make-up. Probably a good one for sensitive skins or to gently wake up your skin in the morning. The day cream, with extract of chamomile, is a great, nourishing, everyday moisturiser and smelt delicious. My skin felt hydrated for hours afterwards without a hint of greasiness. But my favourite had to be Ren’s Active 7 Eye Gel. It’s incredibly cooling and definitely took out some of the baggage I was hauling around under my peepers! Tired eyes will love this. The November issue of InStyle is on sale for the bargain price of £2 (normal price £3.90). Full sized versions of these Ren products, costs and stockists are listed below. Natural credentials: Ren pride themselves on using only 100% plant and mineral derived ingredients and avoid anything synthetic.